Hey guys! 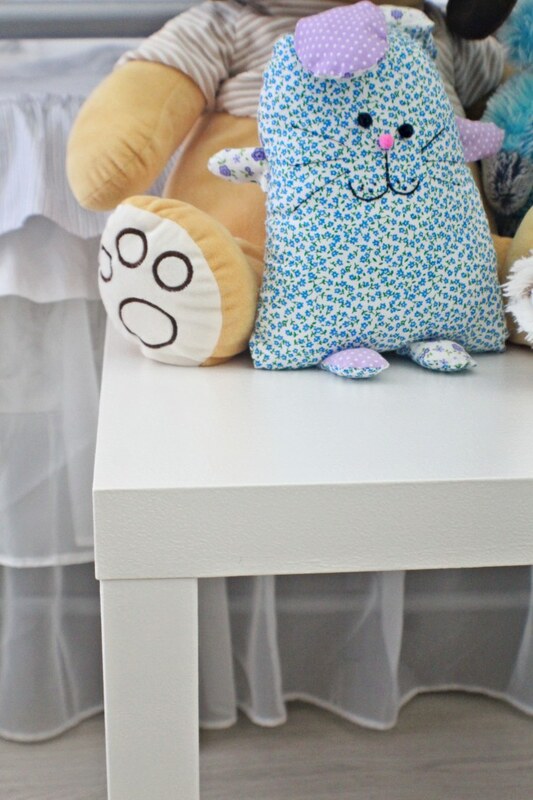 Today I have a pretty simple and quick idea for a coffee table makeover! This genius refurbished coffee table idea was inspired by an old Ikea Lack table we’ve had for a couple of years! After Ellie has practically abused this table in countless ways, it became too ugly to keep and we almost thew it away! It looked like this. I realize this coffee table makeover may not seem like much! After all anyone can do a painted coffee table DIY! But if you ever owned an Ikea Lack table you know they’re made out of a special material that is pretty hard to paint or if you do, the paint won’t resist in time. 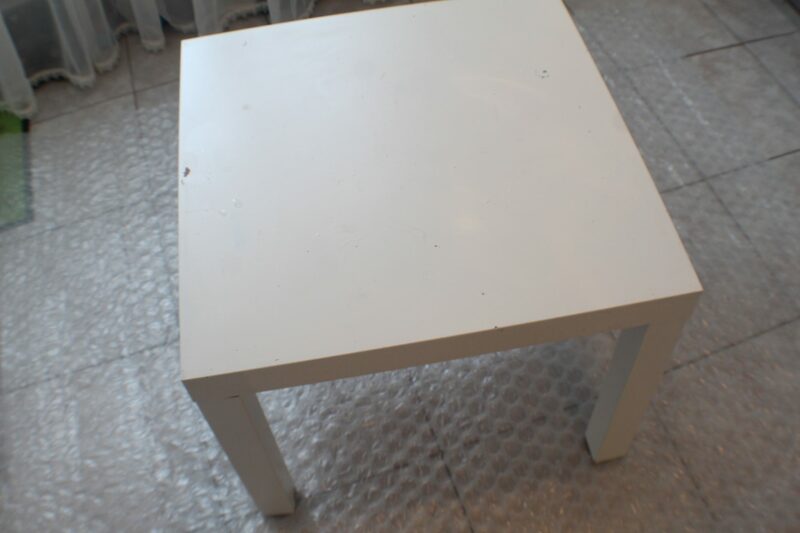 The Ikea Lack tables are made with particleboard, fiberboard, acrylic paint, ABS plastic and paper (the paper actually goes inside the top, arranged in a honeycomb shape which makes the table very solid and durable). Because of these ingredients, I’ve been told regular painting just won’t do. So I wanted to try my hand at this small, light but durable and super useful table and so I proceeded onto making this coffee table makeover. I’ve been told this kind of tables cannot possibly be sanded but the naysayer in me had a different opinion! So I went ahead and lightly sanded the table using a super fine sanding sponge/block. And the naysayer proved to be right! The home depot guy also told me the only kind of paint I can use is acrylic paint but the mentioned naysayer HAD to buy wood paint! Especially after the beloved husband of the mentioned naysayer said he has a hunch any paint would work! And so I went ahead and applied wood paint and guess what? It worked wonders! All in all this simple coffee table makeover was a success and it only involved about half an hour of work, without taking into count the time allowed for drying in between layers. Before this simple transformation, this refurbished coffee table was used by my daughter for her drawings and paintings. 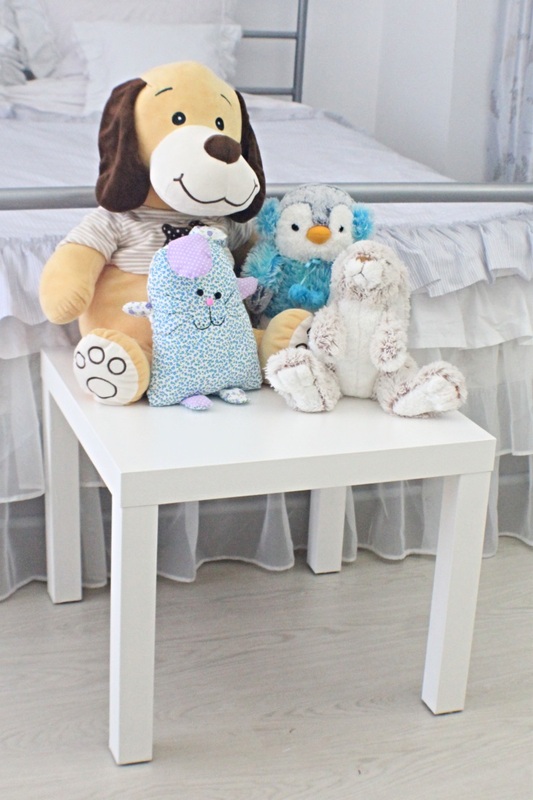 Now it’s re purposed into a bed side table idea to hold Ellie’s toys during the day time (she sleeps surrounded by loads of toys at night time). I wanted them to be easy to reach when Ellie is ready to go to bed so the bed side seems like the perfect spot. As I mentioned I have another idea to upgrade this Ikea table even more but until then, we’re pretty happy with its new purpose! Here are the materials I used and the exact step by step tutorial! 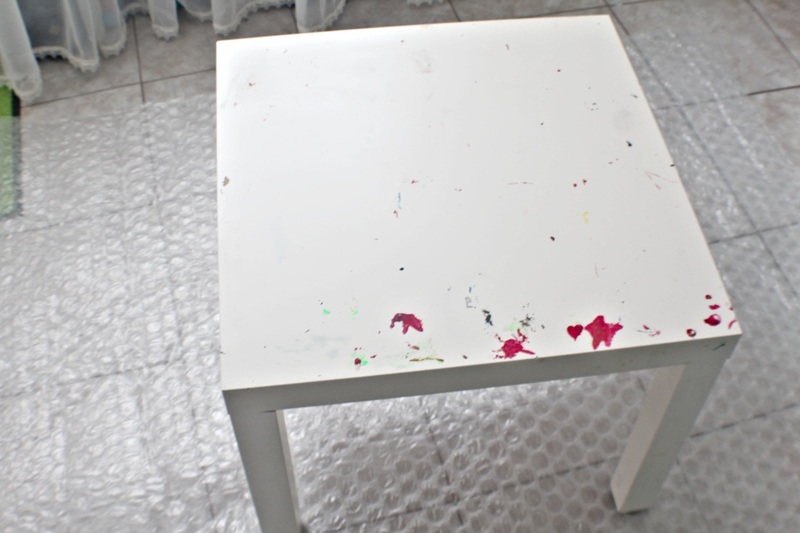 Place the table on a large piece of cardboard to protect the surrounding surfaces from paint spills. 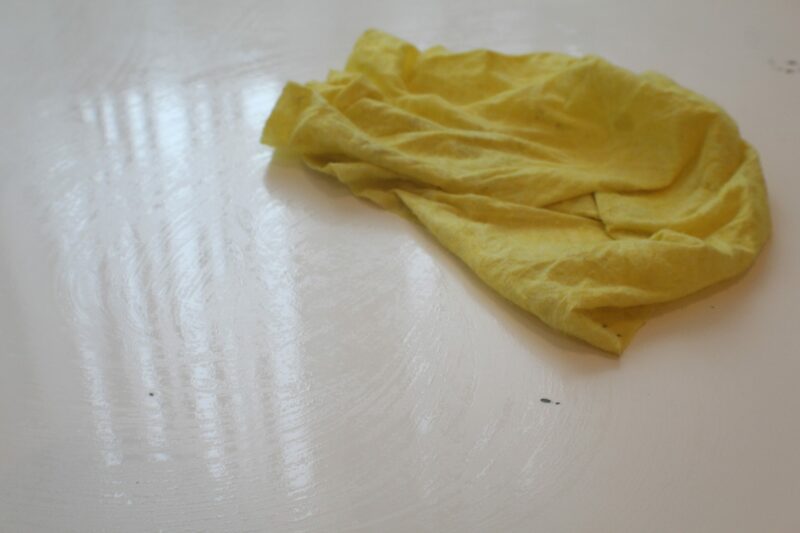 Clean the table thoroughly with a damp cloth soaked in soap and water. 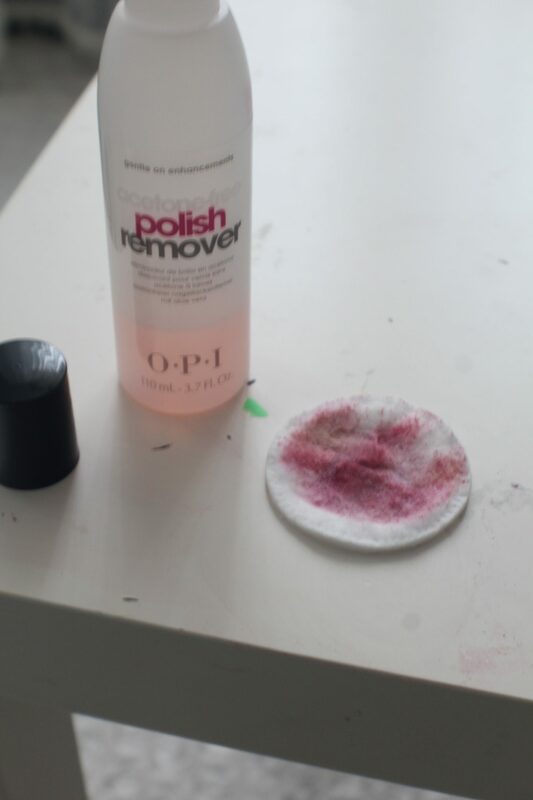 If the table is too dirty or has paint or nail polish spots, use nail polish remover and cotton pads to dissolve and remove those spots. Nail polish remover works wonders on this kind of tables! Let the table dry or wipe with a dry cloth then lightly sand the table and the legs using a 120 grit sanding sponge. Don’t over sand though! Looking at the table from an angle you should be able to see that the table has been sanded and lost a bit of the shine, but without completely removing the first layer of the table. Also as you sand, the sanding sponge will get colored in the same color as the table so this should be a good enough sign you are actually sanding successfully. What you aim for is to give the table a tiny bit of a rough texture so the paint would stick and last for a long time without chipping. You may find that your table doesn’t have a super even surface and the sanding will reveal some of the layer that’s under the paint in some tiny spots (as observed in the photo in the next step, below). Don’t stress about those, they’ll get covered with paint later on and will be completely hidden. Wipe the table clean with a damp cloth then dry it with a dry cloth. 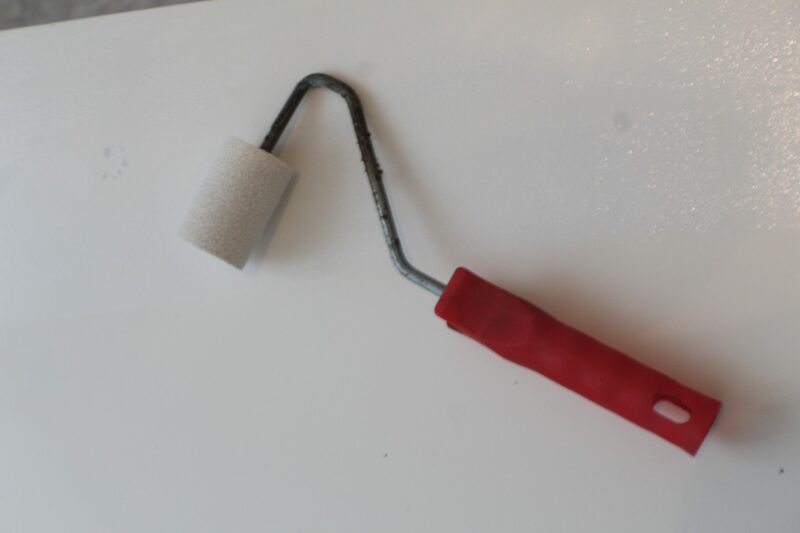 Pour some paint into the paint tray and lightly soak the paint roller into paint. Depending on the thickness of your paint, you may need to thin it with paint solvent. 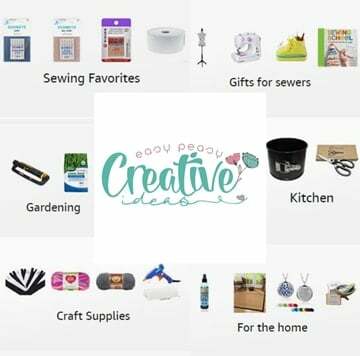 You want to apply 2-3 thin layers that are smooth, flat and even instead of one or two thick layers that might get bubbly and uneven and make the paint chip easily. I found a narrow paint sponge does a better job, especially on the legs. Allow enough time for drying between layers. When I was done painting, I considered my Ikea Lack table makeover a complete success even thought the table didn’t have the same shine and smoothness as before. It was still looking really nice and polished and I loved that it had a brighter white than before. And most importantly, it looked clean! Even more importantly, I didn’t spend any money as I already had all of the supplies on hand! I hope you found inspiration in my tutorial! If you get to use it on your own table makeover, I’d love to know the outcome. So please come back and leave a comment! Thanks!